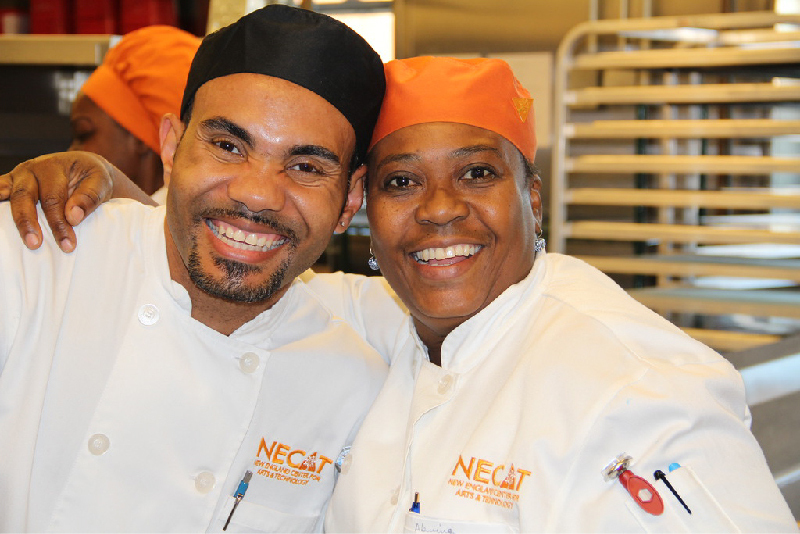 NECAT provides chronically unemployed adults with a pathway to stable, long-term employment in the food services industry through comprehensive technical and job readiness training and individualized support and employment services. Every individual, no matter his or her circumstances, deserves a chance to thrive in a world-class learning environment. Students learn best in a culture of hope, personal development, respect and fair practice. Effective learning focuses on individual needs, aspirations, interests and prior experiences. People experience success in a creative learning environment with high, but reachable expectations. Vic Acosta is a human services professional with more than twenty years of experience. He is a passionate and engaged community advocate who has helped individuals and families experiencing homelessness, living with substance abuse disorders, and mental health challenges. Vic has worked in almost every aspect of human services with progressive responsibility, most recently as the director and founder of Dreamfar Triathalon. He also is the founding program director of Back on My Feet Boston, a structured self-efficacy program that helps individuals attain employment, housing, and education. Vic has a degree from Manhattan College and is presently studying for a degree in Health Sciences, Social Work Concentration, from Northeastern University. 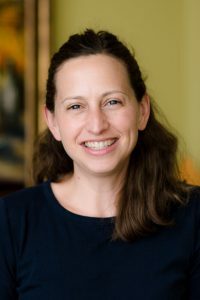 Ashley came to NECAT with experience in development from the American Heart Association, American Cancer Society and Horizons for Homeless Children, and an MBA in Non-Profit Management. Paige has worked in culinary roles in luxury hotels and country clubs across the country. Most recently she was a chef at FareStart in Seattle, leading their catering department. Paige has a passion working with students to prepare them for a successful career. Jon Braley is our volunteer Career Coach assisting students through all phases of their job search. He also coaches students in some of the soft skills essential to their success after they have been hired. In his long career prior to joining NECAT, Jon held finance and operations management positions at Honeywell, Data General, Digital Equipment and Compaq, eventually retiring from Hewlett Packard. He is also a certified mediator. With six years’ experience as an admissions advisor at Le Cordon Bleu, Elise is skilled in working with a diverse student population ranging from recent high school graduates to career changers. Joey has had an extensive career in public service. Prior to NECAT, Joey served as ED of the East Boston Y for eight years. Under her leadership, the Y’s initiatives flourished, widely recognized for their program quality and innovation, and she instituted a scholarship program and obtained private funding for the construction of an East Boston teaching kitchen and garden. Joey also worked in PR for the Piers Park Sailing Center in East Boston. She previously spent nearly 20 years as the Director of Communications for the Massachusetts Port Authority. Chef Kristine holds degrees from Le Cordon Bleu College of Culinary Arts Cambridge and the Culinary Institute of America. She is passionate about teaching and has been a Culinary Instructor at North Shore Community College since 2013. 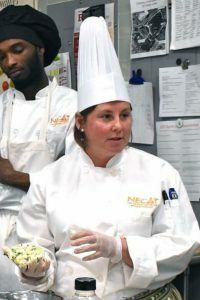 Kristine joined NECAT’s team as our Chef Instructor at Everett in January 2018. 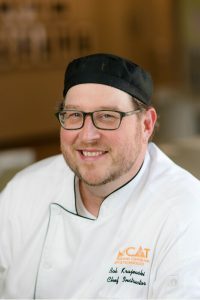 Bob has extensive experience as an Executive Chef and baker, helping open three highly acclaimed restaurants, in addition to his own French bistro. He also spent two years teaching at the New England Culinary Institute in Vermont. He has a powerful ability to connect with our students and get them excited about their future potential. Bob works with students in the first half of our program. Martha Leahy is a food executive and chef with over twenty-five years of experience. 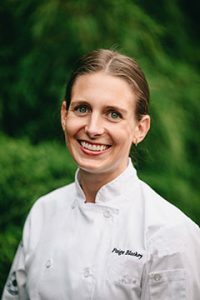 She has worked as an Executive Chef for restaurant chains, as a Corporate Executive Chef in research and development for both retail grocery stores and in manufacturing, as VP of Purchasing and as a consultant. 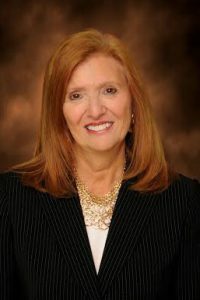 Martha is also experienced in teaching and leadership training. She has worked every position in a restaurant through the years, from dishwasher to Executive Chef for a twenty-restaurant chain. 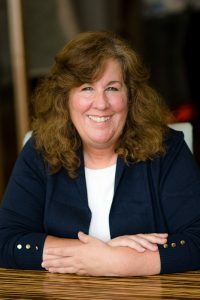 Martha holds degrees from the University of Michigan, Johnson and Wales University in Rhode Island and the International Culinary Institute for Foreigners in Italian Cooking in Italy. Tom has ten years of teaching experience, both in a university setting and with a similar non-profit in California. He has an additional thirty years of experience in professional kitchens. He has a wealth of knowledge and extensive curriculum development experience. Tom works with students through the second half of the program and masterfully oversees the entire class while providing critical one-on-one support. Deryck Reid is an expert in helping marginalized young people prepare for adulthood and employment. He has experience providing consulting and coaching at STRIVE, Operation Exit and Building Pathways. Jessica has worked in the non-profit sector for her entire career, across causes she feels passionate about and on both sides of the Atlantic. Prior to joining NECAT she lived in Northern England for five years where she helped launch a new center for contemporary art and discovered the beauty of the Yorkshire Dales. Jessica holds a B.A. from the University of Wisconsin-Madison and an M.A. 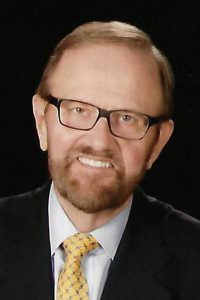 from the University of Westminster, U.K.
Maarten Hemsley (NECAT Founder, Board Chair & President) is a semi-retired financial executive with many years experience managing public companies. Rick Catino (Treasurer) is a businessman and CEO of Clear Point Partners LLC. Prior to Clear Point, Rick was a longtime executive at HP. He and his family reside in Medford. 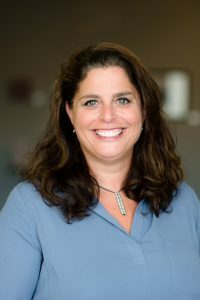 Jennifer Corcoran is a Project Director for Joseph J. Corcoran Company and volunteers with many organizations, including the Boys and Girls Club of Dorchester and Charlestown Lacrosse & Learning Center. 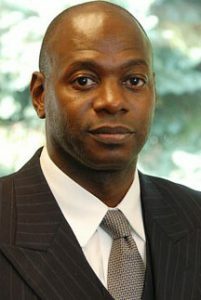 Emerson Foster is VP of Human Resources, North America and Global Strategic Accounts for Sodexo Corporate. 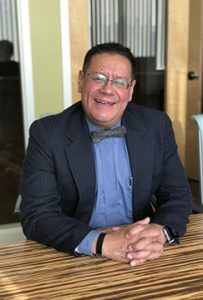 He also has extensive non-profit experience and currently sits on the boards of the MA Business Alliance for Education, and BAM – Becoming A Man Boston. Shawn Goldrick is Patient Support Services Director at Boston Children’s Hospital. Reverend Dana Gonsal is Senior Pastor of the First Baptist Church in Dorchester, President/CEO of The Classic Shoe Shine Corporation and a vital community advocate. 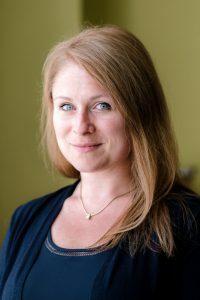 Rebecca Hemsley is Director of Marketing & Advertising at South Coast Almanac LLC, and serves as President for the Foundation for Wareham Education. Andy Henke is Senior Vice President of Strategy & Business Performance at Santander Bank. He holds an MBA from Boston College. Joseph Leibowitz is Executive Chef at Encore Boston Harbor. Previously he had a 12 year career at Wynn Las Vegas. Joanne Massaro is newly retired after working for the City of Boston for almost 20 years, most recently as the Commissioner of Public Works. Barry Nelson is currently an independent fundraising consultant, with extensive experience in radio production and public radio fundraising. 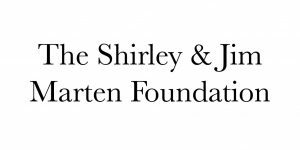 Sheila Peterson is a the Chief Development Officer at Trinity Boston Foundation. Previously, Sheila was a strategic collaboration and philanthropy consultant and a VP of the State Street Foundation, where she managed strategic grant-making efforts, including support of NECAT. Michael Rothschild is a principal of Abbott Realty LLC and President of the Newmarket Business Association. Dan Scully is the President and CEO of Hotel California Tequila. His work, prior to the sprits business, was in such diverse fields as hotel management, media management, and consulting. William (Bill) Strickland (Honorary Board Member) is founder and CEO of Manchester Bidwell, and is the inspiration for NECAT. NECAT is launching a new social enterprise in partnership with Sodexo! Plans are in the works to start a food fulfillment business on-site at our Boston Center. The enterprise will provide employment opportunities (paid 4-month apprenticeships) to our current students and recent graduates. 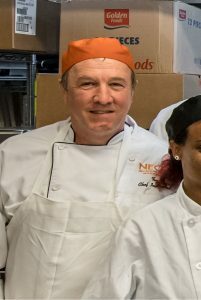 The "grab-and-go" food prepared by NECAT will be distributed to hospitals, universities and companies in the downtown Boston area. More information to soon follow! 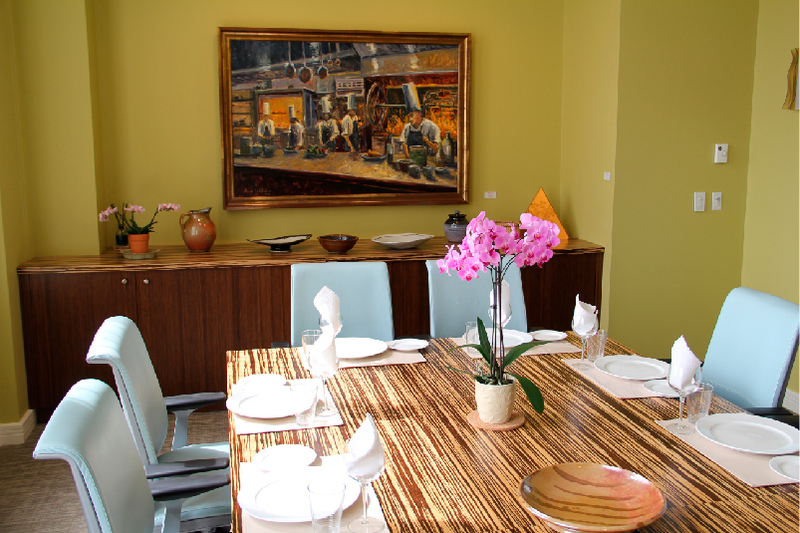 Make NECAT your main ingredient when planning your next corporate or private party, meeting or team building workshop. Our talented chefs will work with you to create a tailored menu and customized experience. 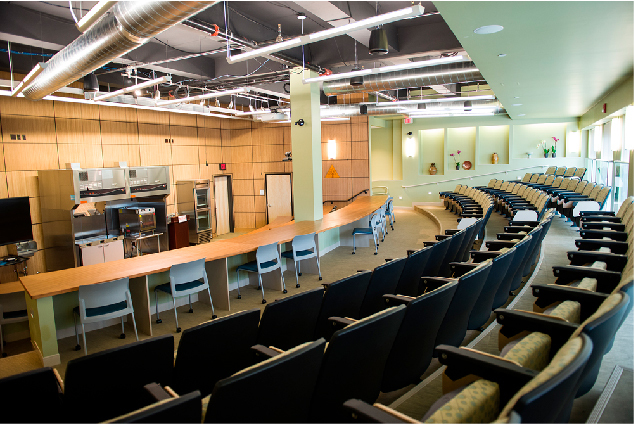 Together with our beautiful facility and important organizational mission, it is sure to be an event that you and your guests will remember for years to come. We want to thank the following donors who have provided critical support to NECAT. As a nonprofit organization, we depend on the generosity of our community and supporters in helping us achieve our mission. We thank the following donors who have provided critical support to NECAT. If you’d like to join our community of supporters, we welcome you to check out our donation options! We occasionally have openings for positions at NECAT. If you’re passionate about our mission and want to join our team, please contact us, and we’ll get back to you with any current opportunities and more information. NECAT strongly believes in the valuable role that volunteers play in furthering the development of our students and the overall mission of the Center. NECAT welcomes volunteer tutors (particularly math), counselors, social workers, guest speakers, mentors, internship placements and job opportunities.